Feathercoin (FTC) has hard forked from the Scrypt algorithm to the NeoScrypt as was announced earlier this year after block 432000. You need to update your wallet to Feathercoin 0.8.7.0 in order to continue using it after the NeoScrypt update and you need to download a special version of cgminer with support for the NeoScrypt algorithm (link below). The goal of the hard fork away from the Scrypt algorithm is to make FTC not mineable with Scrypt ASIC miners giving back the opportunity to GPU miners to mine the coin. Currently the profitability of mining FTC is quite high compared to other coins that are being mined with GPUs, so there is high interest in Feathercoin at the moment. Do note that here is no special miner dedicated for Nvidia miners to mine NeoScrypt using CUDA, however the version of the cgminer with NeoScrypt support actually works quite well not only on AMD, but on Nvidia GPUs as well using OpenCL. The screenshot above is from a GeForce GTX 750 Ti video card at stock frequencies giving a bit over 40 KHS and with some overclock you should be able to push the performance of a single GTX 750 to about 50 KH/S. Mining with cgminer 3.7.7B with NeoScrypt support (source) on AMD GPUs has something that you make sure to do to get the best performance out of your GPUs. You need to make sure you have Catalyst drivers 13.11 installed, and then run the cgminer to compile the kernel with the settings you are using, then update to the latest 14.9 drivers and run the miner with the already generated kernel (BIN) file with the old drivers. Make sure you don’t change settings affecting the kernel after getting back to the latest video drivers as this will invoke the compilation of a new kernel that will not work and you will most likely be getting HW errors only. Generating kernel with newer drivers and not using a kernel generated with the older 13.11 drivers will not work and you will be getting only hardware errors instead of actual work being done. This is a bit of inconvenience, but you will have to do the driver trick only once and hopefully there will be a fix for this in the future as well as further performance improvements. Currently we are getting about 90-100 KH/s on a single AMD Radeon R9 280X GPU, so the performance on Nvidia graphics cards compared to AMD is looking very nice considering that we are using OpenCL and not CUDA. 90-100 khs at what settings? neoscrypt was added to yaamp a couple days back, for those interested. I would like to know this information as well. can you please post the settings for r9 280x…i am able to run on 14.6 drivers with 70 KH/s…. Eh.. I am running the dev build of SGminer with neoscrypt support, and doing 311 Kh/s on the 2 R9-280X cards I have in my system. How can you guys be satisfied with 70 Kh/s ? Obviously you are not able to achieve such speeds with this earlier version of the miner, there have been some updates for both the miners and the OpenCL Neoscrypt kernels that boost significantly the performance and we have posted these as well. 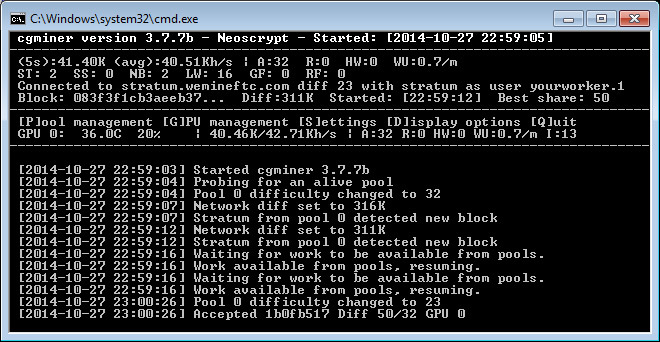 Eh.. 5.1-0-dev sgminer version, with the default neoscrypt.cl compiled into a bin. Downloaded it yesterday, tested with no settings, then started to tweak the settings. Ended up with the above settings, for the avg 311-314 Kh/s. So if you know of any newer better version, either of the miner, or the neoscrypt.cl, please post a link. We are talking about the miner linked in the article above, it is an old one with older kernel that is not able to achieve the speeds you are talking about. The latest sgminer 5 dev does come with the newer optimized OpenCL kernel. Hello .. I ma doubt .. I’m looking to buy one asic A2 terminator 60 Mh / s, most wanted mine in neoscrypt, can tell me whether it is acceptable that my question, or is only possible with mine graphics cards ? ?